Let Rock’n’Roll! 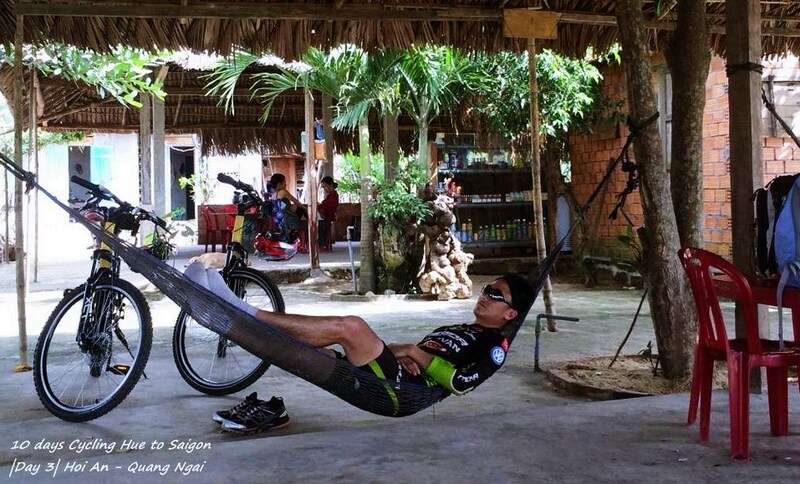 Leaving Hue city, cycling off-road into the villages and through Tam Giang lagoon, the biggest lagoon in Southeast Asia, and passing where the grow and prepare mushrooms on the way. More cycling until we meet HW1 again where we take a van transfer to Lang Co beach for lunch on the beach. After lunch, ride along the Lap An lagoon, also known as “the Venice of Vietnam” before climbing 7miles and descending 7 miles - the Hai Van mountain pass which Jeremy Clarkson of TOPGEAR praised as "a deserted ribbon of perfection — one of the best coastal roads in the world!”. Ice-cream break on the summit of the pass. Now enjoy the thrilling descent with spectacular views of the modern beach city of Danang before transferring to Hoi An ancient town for night. Half-day ride to My Son holyland for sightseeing the Cham’s temple. Or explore the Hoi An ancient town by bike or take the day off of shopping, cooking, drinking. Lunch including in tour. Dinner is on your own. Transfer out of the town over HW1 about 2 hours, from then we will start to rock the day. Go along the coastline, to reach to Son My (Pink ville or better known as hamlet of My Lai). Here we will visit a memorial for the villagers who killed during the War. The My Lai site is in a small rural settlement, surrounded by simple thatched huts, quilted rice paddies and farmers with conical hats going about their day to day routines. Cycle through the rush-hour to the hotel for check-in. Dinner at the hotel. Night at Quang Ngai. Breakfast at the hotel. 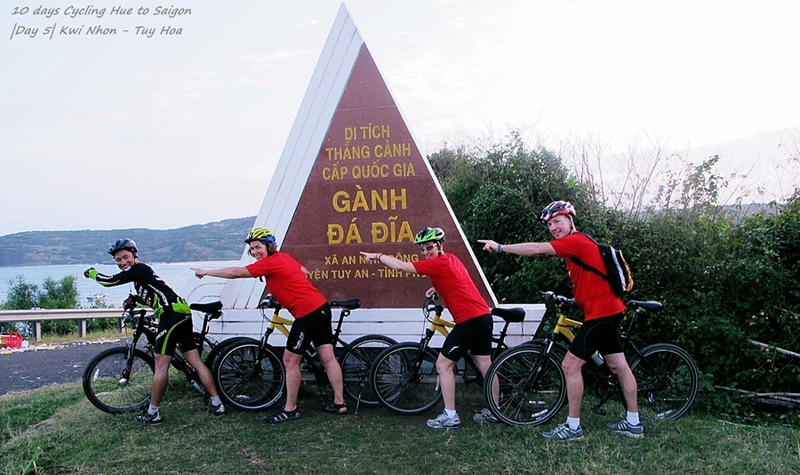 Depart early today for the 157 kilometers journey to Qui Nhon, an American port and supply centre during the Vietnam War which sheltered thousands of Vietnamese fleeing the vicious bombing of the countryside. After being transferred about 2 hours through the coconut jungles to the starting point, we pedal along tranquil roads rarely visited by tourists. There are 2 big slopes today (10-12%) but the best scenes can be seen behind you after heading up the top. Lunch with some fresh seafood at the fishing village along the road. Reach to Qui Nhon in the late afternoon. Dinner at local restaurant. Night at the hotel. After breakfast, ride from the hotel on the hidden paths until we meet the highway 1. Again, avoid it by turning around the Cu Mong lagoon. We may pick some fresh shrimps there for lunch. 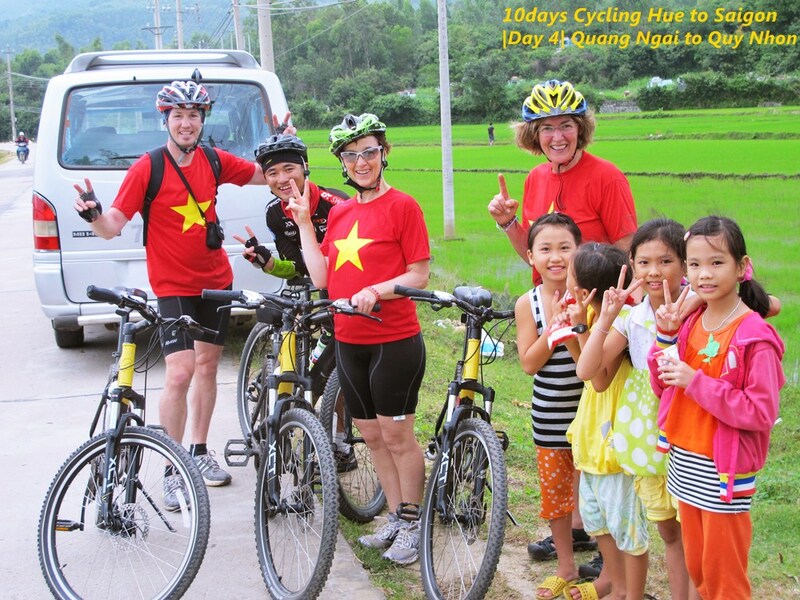 After lunch, loop back toward the main highway where you will have the option of cycling or transferring by vehicle to Tuy Hoa. Dinner and night at the hotel. Depart from the hotel for a 20 kilometers ride past a network of lush rice fields which blanket the valley. Conquering the ocean view around the Vung Ro bay before meeting the pass which is the natural border between the 2 provinces. You are about to descend down to stunning Dai Lanh Beach where you will stop for a swim and some snacks. Continue pedaling along the coast for 3 kilometers and then turn on to the Hon Gom peninsular road for the final 20 kilometers. Van transfer to the hotel on the beach at Nha Trang for night. A hotspring retreat could re-fuel your energy for the next uphill stage. Dinner and night in Nha Trang. Having breakfast, you will be transferred to the starting point at the elevation of 1.200m to pedal up to the Da Lat plateau. Ride to pass the colorful coffee plantations and minority villages on the way. Reach to Da Lat in the middle of afternoon. Cycle around the City of Flowers, stop at the oldest train station since French colonial time before checking the hotel. Dinner with special Tofu and hotpot and Dalat wine. Night at the hotel. Enjoy the real coffee in the foggy morning of Da Lat before leaving the city. Going downhill on small road, passing the pine forests and coffee plantations to reach to Di Linh plateau – the land of tea. From here, you are transferred to Saigon for night. Well done! Celebration night in Saigon. It’s freeday for you to explore our Saigon (Suggested: tour to Cu Chi tunnel). Free until the time to be transferred to the airport for your next departure. Thank you & See you again! - Alcoholic drinks & drinks at meals + Optional tours + Personal expenses (Telephone, laundry...). - Tips for guide, driver, boat crew & hotels' porters. - Meals not indicated in the itinerary. - Other services not clearly indicated in the package inclusion above. We strive to consistently amaze, surprise, and delight. For this reason, each itinerary may be subject to slight modifications. Contact us to speak with a destination specialist for the most up to date tour inclusions. Oh No! Your message failed. Please try again! **In order to reserve an available place, after submitting this booking tab, please send to [email protected] a scanned copy of your passport and requested date.